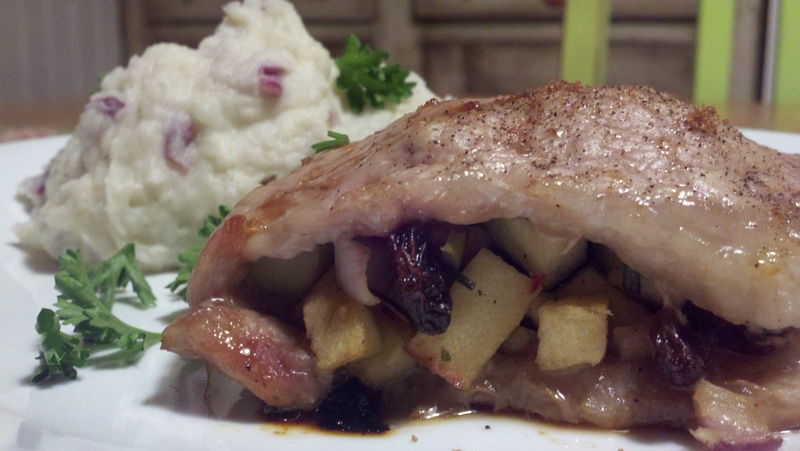 A few years ago I started cooking with Red Bliss Potatoes… and I never looked back. They are by far the best potatoes in God’s creation, for one reason- you don’t need to peel them! Also, they are hearty enough to stand up to an all-purpose potato, they come in a variety of different sizes, and they add beautiful color to a dish. I use them for all my potato dishes and almost always leave the skins on… Garlic Mashed Potatoes, Twice Baked Potatoes, French Fried Potatoes, Potato Salad, Oven Roasted Potatoes, Scalloped Potatoes, Potato Skins, Potato Soup…. Now I’m starting to sound like the Idaho version of Forrest Gump!! But anyway, give them a try. These here, are thee easiest Mashed Potatoes. They go great alongside Apple Stuffed Pork Chops. Leaving skins on, chop potatoes, then boil in a large stockpot of water until fork tender. Drain potatoes, add the rest of the ingredients and use electric mixers or potato smasher to mash to desired consistency.